CBD isolate is the most pure form of CBD you can get. After all, it’s just CBD isolated all by itself, without any of the other cannabinoids found alongside it in the hemp or cannabis family of plants. Without anything else accompanying it, CBD gets a chance to shine and work its powerful plant magic. CBD isolate can come in a few different forms, such as powder, crystals, and more. 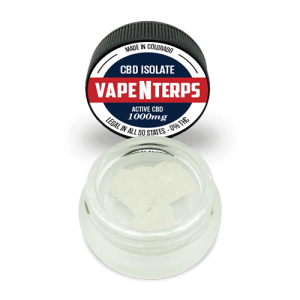 When you mix CBD isolate with natural plant terpenes, it becomes CBD shatter, which is another CBD product entirely. 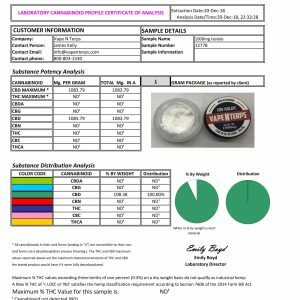 Our CBD isolate tests out at a very high purity — we use only the best for our customers! One of the main reasons that people love isolate is for the freedom and versatility it provides. You can use it as a base and let your creativity flow freely from there. This pure form of CBD is ready to become whatever you dream up! It can be added to food, mixed into oil to vape, even sprinkled on top of a salad. We mean it when we say that isolate is an extremely versatile form of CBD! Since it contains no THC, an isolate will provide you all the benefits but none of the high. Versatile — can cook with it or add it to your favorite food or drink!